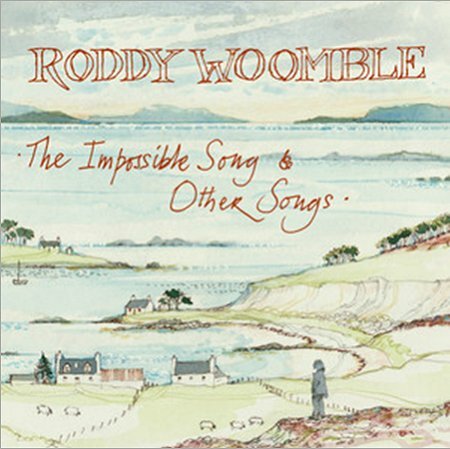 A Roddy Woomble related release is always an object of much expectation for me, be it an Idlewild, McCusker Drever Woomble concoction or this his second proper solo offering. There is something about his vocal that seems ceaselessly compelling. Reviews so far have been solid if not ecstatic. Maybe this reflects the waning of the interest in his ‘new’ folk direction, maybe that the path he started to tread with Idlewild and then outside the band, is a path now with a greater number of more commercially successful artists. The nu-folk contingent has had notable successes with the likes of Laura Marling, Mumford & Sons, Noah and the Whale as well as his fellow countrymen Lau. Perhaps Impossible Songs doesn’t have the immediate impact of My Secret is My Silence but it still contains more than your average number of good tunes and is an album that grows with successive plays. In good evidence too is the lyrical wordsmithing that Mr W is known for, the ability to draw a picture or describe an emotion that has so marked out much of his work. Make Something Out of What it’s Worth and Tangled Wire are good examples here. There is some fine playing here too but without any grandstanding. It seems fitting somehow to have Gavin Fox on bass (and nice to have the bass a little more prominent in the mix) with his past Idlewild role and the fine drummer Gregor Donaldson from Sparrow and the Workshop together with Ms Aitken and Mr Maclean both of whom feature in the live show. The Union Chapel is one of my favourite venues and is perfect for the more acoustic set -the acoustics are fine, you are never far from the action and there is an immediacy to every gig. Well tonight’s support Mr Jack Cheshire clearly felt the same : “the best big I have ever played” he spluttered out. He seemed taken aback to be there and at the end of each song looked a little sheepish, surprised that he was being listened to and appreciatively at that. Apparently he normally plays with a jazz drummer and a stand up bass but tonight he had the tough call of just standing up on his own singing with his guitar. But a super fine job he made of it managing to bring something clearly his own to the folk troubadour role. A strong and distinctive voice with some inspired acoustic guitar. I do have a soft spot for this sort of thing and you could sense something out of the ordinary here as shown by the people queuing at the merch desk ready to buy, as encouraged by Mr Cheshire. Despite his promise to be there he instead sloped off for a fag, but no matter, his new album to be launched in June was available for early purchase and purchased it was. Here’s a chap well worth seeking out if he rolls by your patch. Mr Woomble along with the excellent Seonaid Aitken violin, piano and vocals, Sorren Maclean on guitar and vocals and Duncan Lisle on stand up bass, slipped on stage with little fanfare catching some still in the bar. Opening with my personal highlight from the new album, Make Something Out of What It’s Worth, the set was a pleasing blend of the new tracks and favourites from the McClusker Drever Woomble album and Mr Woomble’s first solo – Waverley Steps (now escalators we were informed ), Silver and Gold, Into the Blue and more were all there. The new tracks stood up well in such esteemed company lacking only greater familiarity. Quite a sublime evening of four talented musicians performing quality material in an ideal setting. The best music triggers the most profound emotions, and this soaring, seemingly effortless music triggers a calm elation (if that isn’t somehow contradictory), there is something timeless and comforting, secure and intimate. Just to top it all after such an exemplary evening they were kind enough to finish in time for me catch an earlier train back westward – what kind and considerate chaps they are. The slightly flaky video of Waverley Steps gives a flavour of the whole kit and caboodle – sorry its not a better quality …. This entry was posted in Uncategorized and tagged Edwin Morgan, Gig, Jack Cheshire, Roddy Woomble, The Sparrow and the Workshop, video. Bookmark the permalink.